Mandibular fractures play a significant role in craniofacial trauma and account for nearly 50% of the facial fractures. Fractures of the mandible are also known to be the second most common facial fractures after the nasal bone. They can be treated by closed reduction methods such as intermaxillary fixation (IMF) or open reduction and internal fixation (ORIF). Owing to the several disadvantages reported with IMF, such as compromised airway, poor oral hygiene, speech difficulties, weight loss accompanied with impaired nutritional intake, and atrophy of the masticatory muscles, ORIF has gained increasing acceptance for the treatment of mandibular fractures. With the current advancements in the field of oral surgery, ORIF has become a mainstay for the management of mandibular fractures. Some of the putative advantages of ORIF are anatomic reduction, early return to function, and patient's compliance and are treated by analgesics and soft diet. The postoperative complications of ORIF include occlusal disturbances, infection, wound dehiscence, and nerve injuries. Rare complications such as osteomyelitis have also been reported to occur due to surgical manipulation. The incidence of these postoperative complications in the parasymphysis, angle, and condyle regions of the mandible is assessed in this study. Healthy adults between 50 and 60 years of age with clinically and radiographically proven mandibular fractures (parasymphysis, angle, and condyle) that were indicated for ORIF procedure were included in the study. The cases operated under general anesthesia (GA) were included in the study. Patients with diabetes, hypertension, and other systemic illnesses that cause immunodepression are excluded from the study. A number of patients were not willing to be included in the study. A retrospective study was done in the Department of Oral and Maxillofacial Surgery in Saveetha Dental College and Hospital, Chennai. A sample size of 98 patients reporting to the hospital between January 2014 and November 2016, diagnosed with a mandibular fracture of the parasymphysis, angle, and condyle regions, treated by ORIF under GA were included in the study. The 98 patients were split into three groups A, B, and C with parasymphysis, angle, and condyle fractures, respectively. The groups comprised 36, 28, and 34 patients, respectively. The patient's records were analyzed for deriving the number and type of complications that occurred during the postoperative period of ORIF in these groups. The follow-up period was between 3 months and 2 years. The surgery was done under GA with nasotracheal intubation. Postoperatively, the patients were not put on IMF; standard antibiotics and oral nutrition were administered. Parasymphysis and angle fractures were treated using intraoral approach (vestibular incision), whereas condylar fractures were treated using extraoral approach (transparotid approach). Date of registration– March 2, 2017. It was noted from each group that the most common complication was infection leading to plate removal. The other complications that followed them were wound dehiscence, occlusal disturbances, and neurological disturbances such as paresthesia and facial nerve paralysis (FNP). Inferior alveolar nerve paresthesia in patients was transient and resolved within 3–6-month postoperatively. The complications were noted in all kinds of age groups including pediatric and adult patients and were predominantly seen in males than females. It was also noted that the condyle region showed the highest incidence of postoperative complications when compared to the angle and parasymphysis groups. 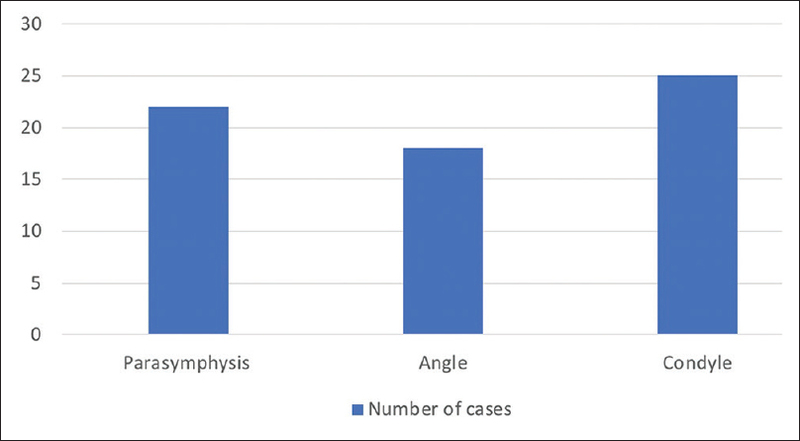 The number of cases that had infection/plate removal, paresthesia, wound dehiscence, malocclusion and FNP following ORIF procedure in the parasymphysis, angle, and condyle fractures are given in [Table 1]. ORIF procedure has gained universal acceptance for the management of mandibular fractures; however, it is not devoid of complications. It depends on the clinical presentation, surgical expertise of operator, and facilities provided at the maxillofacial surgery units. ORIF promotes primary bone healing without the extended period of intermaxillary fixation for immobilization. Despite the several advantages posed by this method, the patients are seen encountered with complications such as malocclusion, infection, disturbed wound healing, paresthesia, FNP, and fracture of hardware. The most common mandibular fracture is condylar fracture that accounts for 17.5%–52% of all mandibular fractures. An open approach to the treatment of condylar fractures has become increasingly common, and some of the complications of ORIF in this region are paresthesia, infection, and facial paralysis or palsy. Some literature reports suggest infection of maxillofacial fractures to be the most commonly encountered postoperative complication of ORIF and mandibular fractures to be related with the highest rate of infections when compared to other maxillofacial structures. [Figure 1] shows that the incidence of infection is the highest in parasymphysis region of the mandible (43%). However, there are other studies in which wound dehiscence (13%) was reported with the highest rate of incidence that was followed by malocclusion (7.5%) and infection (5.7%). It is learned from certain studies that in comminuted mandibular fractures, infection occurred due to extremely loose hardware, that is, otherwise less likely to happen. In another study, 15.5% patients presented with paresthesia of lower lip that was recognized due to mental nerve damage. The results obtained from a research study are that the incidence of malocclusion was 7.3% and plate breakage was 1%. Patients also reported with lower lip paresthesia that resulted due to direct injury and had severed the mental nerves. There is substantial evidence indicating the incidence of postoperative complications of ORIF procedure in the treatment of mandibular fractures from various literature studies, and it is clearly understood that infection, paresthesia, wound dehiscence, and malocclusion are the most common followed by FNP, delayed union, and malunion. ORIF is substantially proven to be a universally accepted, gold standard treatment for mandibular fractures owing to its several advantages. The most common postoperative complication of the procedure in this retrospective study was found to be infection of the plates. Despite aseptic protocols followed in the operation theater, the incidence of infection was high, attributing it to the poor oral hygiene status of patients. There happens to be poor awareness among patients in the rural areas about following oral hygiene practices. In light of these events, there is a need for educating patients and creating awareness on adopting healthy lifestyle practices that eventually helps to prevent the occurrence of infection. Therefore, a prospective study is to be undertaken to determine the impact of oral hygiene education and enhanced postoperative care to improve infection control. However, other complications including fracture of hardware or screw loosening were least encountered, and facial nerve injuries were reduced with surgical expertise. ORIF is thus a preferred treatment of choice over IMF due to many disadvantages posed by the closed method. Koshy JC, Feldman EM, Chike-Obi CJ, Bullocks JM. Pearls of mandibular trauma management. Semin Plast Surg 2010;24:357-74. Saman M, Kadakia S, Ducic Y. Postoperative maxillomandibular fixation after open reduction of mandible fractures. JAMA Facial Plast Surg 2014;16:410-3. Bodner L, Amitay S, Joshua BZ. Clinical outcome of conservative treatment of displaced mandibular fracture in adults. Surg Sci 2013;4:500-5. Khoso NA, Punjabi SK, Channar KA. Patient's presentation with mandibular fractures at liaquat medical university hospital, Hyderabad. J Liaquat Uni Med Health Sci 2013;12:22-5. Ahmed Z, Shaikh Q, Arshad O, Abro MI. Immediate post-operative complications in the treatment of mandibular fractures at angle region by rigid fixation using mini bone plates with or without intermaxillary fixation. Ann Pak Inst Med Sci 2014;10:27-32. Khitab U, Khan A, Khan MT. Outcome of rigid internal fixation of mandibular fractures: A prospective study. Pak Oral Dent J 2009;29:207-10. Bodner L, Woldenberg Y, Puterman M. Drill failure during ORIF of the mandible. Complication management. Med Oral Patol Oral Cir Bucal 2007;12:E591-3. Shi J, Yuan H, Xu B. Treatment of mandibular condyle fractures using a modified transparotid approach via the parotid mini-incision: Experience with 31 cases. PLoS One 2013;8:e83525. Barham HP, Collister P, Eusterman VD, Terella AM. The relationship of the facial nerve to the condylar process: A Cadaveric study with implications for open reduction internal fixation. Int J Otolaryngol 2015;2015:715126. Abdelfadil E, Salem AS, Mourad SI, Al-Belasy FA. Infected mandibular fractures: Risk factors and management. Oral Hyg Health 2013;1:1-8. Rahman P, Aslam A, Yunus M, Luqman U, Saleem MM, Mughal J, et al. Optimal and efficient management of mandibular fractures. PakOral Dent J 2015;35:198-203. Chrcanovic BR. Open versus closed reduction: Comminuted mandibular fractures. Oral Maxillofac Surg 2013;17:95-104. Ahmad M, Hussain SS, Malik SA. Analysis of fixation in mandibular fractures at Pakistan institute of medical sciences, Islamabad. Ann Pak Inst Med Sci 2008;4:105-8. Ahmad M, Hussain SS, Malik SA. Two years review of facial fractures at a tertiary care hospital in Islamabad, Pakistan. J Liaquat Uni Med Health Sci 2008;7:13-7.